Johnson is helped from the field at the MCG. 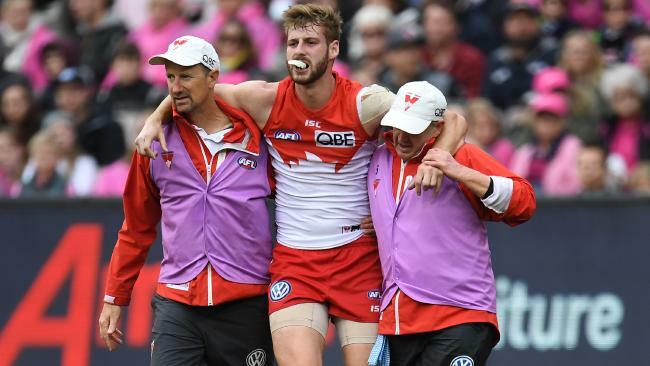 LUCKLESS Sydney defender Alex Johnson has suffered yet another serious knee injury. 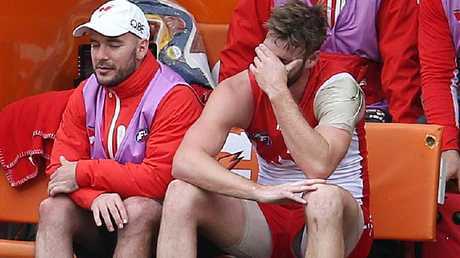 The Swans have confirmed they fear he has torn his ACL. Johnson, 26, suffered the injury late in the opening term of the clash against Melbourne at the MCG on Sunday, his first game at the venue since the 2012 grand final. I"It is his knee he's having trouble with, it looks like an ACL which is disappointing for everyone," Sydney football boss Tom Harley said. "He, more than anyone knows we have a job to do now. "He is a much admired character. It's disappointing for him but I am sure, hopefully the guys will get up." Despite his own personal injury blow, Johnson still got around his teammates at quarter-time rather than sitting on the bench or retreating to the rooms. It is yet another cruel blow for Johnson who played his first game in six years last Saturday night against Collingwood and impressed. He said in the aftermath of that game he was keen to make up for lost time. Johnson has already had five knee reconstructions and a total of 12 surgeries on his knees after reoccurring knee infections. He also underwent groin surgery this year. The football world was quick to throw their support behind Johnson, including fellow knee victims Brodie Smith and former Hawk Alex Woodward who has torn his ACL four times.